Spines on the leaves, doesn’t stop the bugs though! On the excursion to see the leatherbacks, we had got to know two additional members of our group that would join us for the rest of the 4 days- Iris and her granddaughter Amy. Iris is a very interesting person who has not just been, but really seen and lived in various parts of the world. Her wit and will power amazed me then and over the next few days, as she matched us step to step, with a walking stick, on the tricky trail to see the oil birds. Zach, the center’s guide led the way, pointing out several interesting sights on or around the trail. I spotted the white flanked antwren in the area he was hoping to see it, we also saw the great antshrike for the first time that day. The rain forest fauna is unique and exquisite, tree trunks and leaves may have spines growing on them! 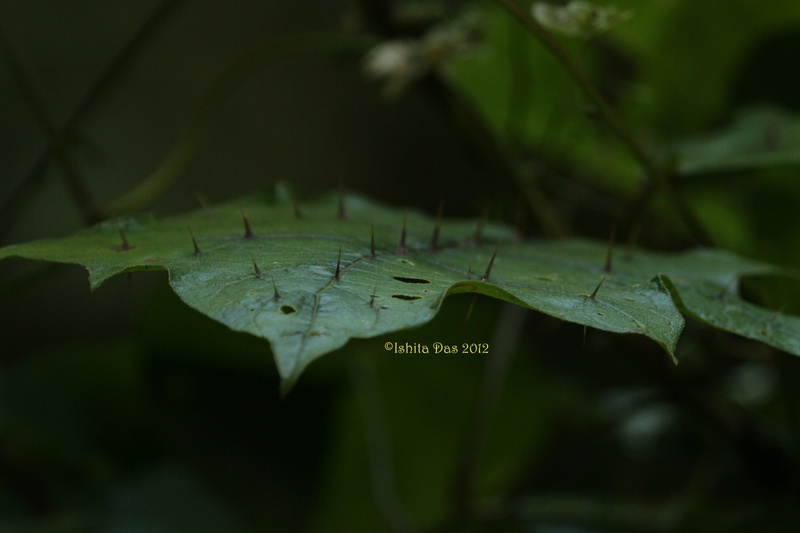 The tree is called the monkey no climb and the leaf is of a variety of nightshade. We hurriedly crossed a nest of army ants and stopped by long enough around their nest, to enrage the soldiers of the leaf cutting ants. 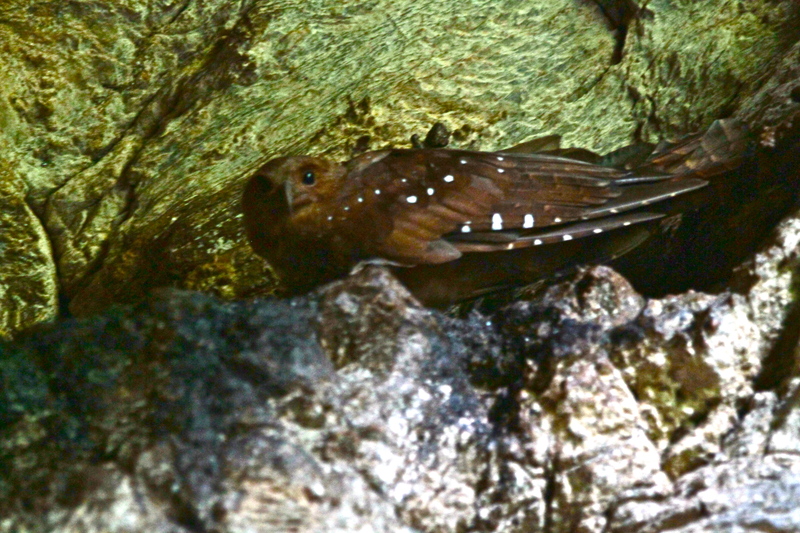 The oil birds are magnificent, they sit around at the outcrops of the edges of their cave that has a small stream flowing through it and are a rufous, brown color with white spots and black bars. Makes them very hard to see in the shadows. Their beak looked like a broadish fish hook to me. On our trek back, it finally rained, the longest and the hardest in Trinidad than it had in the past five days. We were all drenched when we reached the veranda, but it would have been unseemly to return from a rainforest’s rainy season without once being caught in the downpour. After a less than remarkable visit to someone’s house which has numerous hummingbirds, we headed to yet another famous birding avenue- the Caroni swamp located at the Gulf of Paria, on the north west coast of Trinidad.. It was the outing Peggy had come to Trinidad for, to see its national bird- the scarlet ibis, and hundreds scarlet ibises flying in to roost at dusk, awaited us in the swamp. Our special guide and boatsman Lester, pointed to a couple of red capped cardinals, right at the beginning of our boat ride to towards the roosting spot. We saw three varieties of mangroves and sleeping cook’s boas on trees as well and groups of oysters sticking to mangrove roots. Me and Moniraj caught few good glimpses of the tiny and fast flying pygmy kingfisher before shot away. Our small boat parked along with several others to view the in coming, bright red scarlet ibises on to one of the tiny islands. They were accompanied by cattle egrets, snowy egrets and little blue , striated and tricolored herons. Their color will never leave me! Next day, we left for Tobago. We were picked up at the airport by our designated guide for most of the tours in Tobago, Gladwyn. He runs the birding tour company started by his father who may have been the first native birder of Tobago. At a birding spot with a water body, from inside the bus itself, he pointed out several anhingas both male and female and a few that were nesting. I could have looked at them for a lot longer than we were allowed.. Our next stop was at a sewage treatment plant where we were greeted by an immature yellow headed caracara at the gate. There were cattle egrets, nesting in their beautiful breeding plumage, across the narrow road. I think the bush was their honey berry, a very sweet berry, albeit fibrous, flesh encapsulating a big seed enclosed in a green shell. (https://implicitself.wordpress.com/2012/07/25/nesting-egret-in-breeding-plumage/ ) We also saw a young tricolored heron being fed. Some of us saw a small grebe chick on the back of its dad. We could not find the mangrove cuckoo, but we did see a whole family of black bellied whistling ducks, with eight ducklings in tow, cross the pond rapidly. I reminisced about our comparatively shorter trip to a similar plant in Trinidad where we had seen the beautiful long winged Harrier. The most pleasant surprise in Tobago, even after the spectacular drive along the ocean to the place, was our hotel- the Blue Waters Inn. 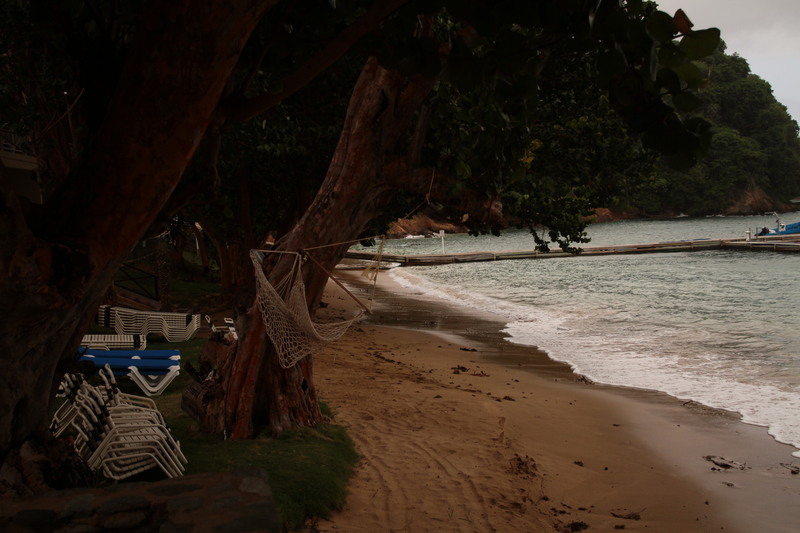 It has a small private beach and luxurious rooms that I had not expected at all. The waters were indeed a beautiful blue with laughing gulls and terns and frigatebirds flying close to the shore with the former fishing and the latter trying to steal the hard caught fish from them! Mahese had said that culturally Tobagans are different from his Trinidadians, and at least from my personal experience I thought so too. It could be the area of the islands we lived in were different in economic status. However, both our main guides thought that the census for population of TNT was incorrect by a wide margin, as the traffic they encountered everyday was ‘clearly’ evidence that there were many more than only about 130,000! And all TNT women are gorgeous! Our next trip was on a glass bottom boat to the little tobago island. From the boat we saw brown boobies waddling along amongst flowering cacti, about 20-30 feet away from us along with sooty terns and the exquisite brown noddys. We all dared the rough ocean and got off of a rocking, moving boat on to a cement jetty without hand holds, to enter the island. Our guide Z, informed us that the whole island was a nature reserve. A long time ago birds of Paradise had been introduced in little Tobago, but their population was wiped out following a hurricane Flora that destroyed many surrounding islands and countries. Upon reaching the summit of the hike I got a few glimpses of the red billed tropic bird and the bridled tern. The forest reserve in Tobago is the oldest forest reserve of the western hemisphere. 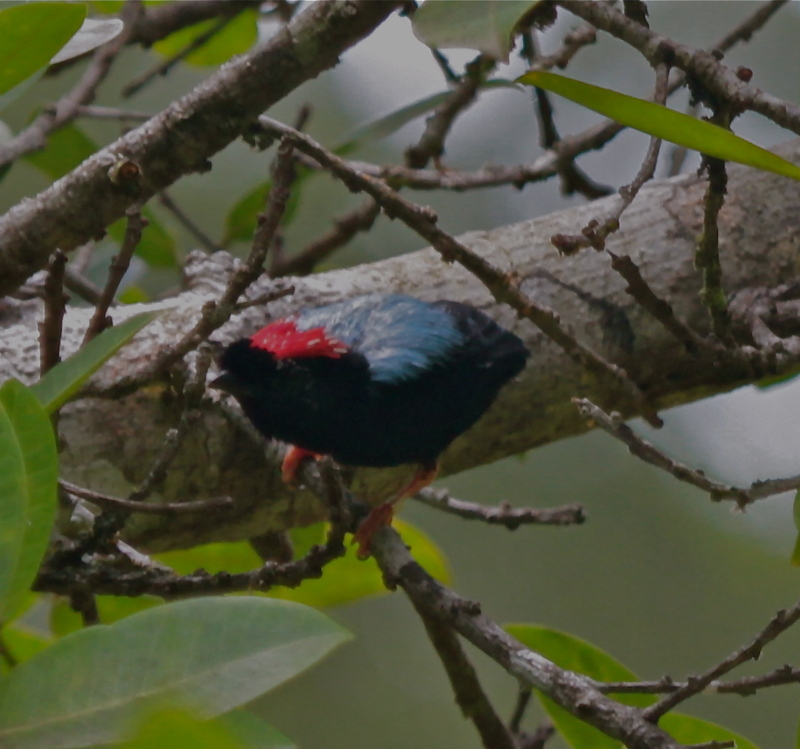 The trail was narrow, muddy and quite slippery, which kept us busy as the blue headed manakins were not forthcoming! We did see the only endangered hummingbird, White tailed Sabrewing, a few times. We saw a tree creeper and a yellow legged thrush as well. I would have been most disappointed at missing the blue backed manakin, but Gladwyn had a trick or two up his sleeve as well. He took us to another spot, not too well known to others, and there our wait was not in vain and a male and female showed up. We saw the male quite close by and they are so beautiful, with white edges on their little red tufts.. and of course the blue back. Such detailed works of miniature art. We also saw a white collared trogon couple with a young one that had not developed a collar yet! As it got close to the end of the trip, we all chose to relax for half a day on the reclining chairs staring at the beautiful view from our hotel, of the island’s contours jutting into the ocean, and creating a small bay for our beach. The lush green small islands made of just a few big boulders, dotting the horizon were a sight for sore eyes. Our ride to the airport was listening to the local ‘calypso’ music, mostly devoted to the ‘female form’.. Enough inspiration, I suppose! I came back with a world of memories and friends for life. Trinidad will always be special to me. The colors of the birds I saw may fade, the names certainly have begun to, but the winding rainforest trails will always beckon, whenever I feel tired. I may take several guided tours over my life from now on, but Mahese will always be right there at the top with the best. I hope someone tells him that.